This Thanksgiving in addition to my traditional mashed potatoes I’m going to serve these crispy creamy hasselbacks. You can never have too many potatoes, right? Or leftovers. Preheat your oven to 400 then combine in a large bowl a half a cup of grated Gruyere and a quarter cup of grated parmesan. Stir in two cups of heavy cream, three minced garlic cloves, and salt and pepper to taste. Grease a large casserole dish with butter then peel eight or so potatoes and with a mandolin or a lot of patience slice to a thickness of 1/8th inch. With your hands toss the potatoes slices in the cheese mixture making sure to coat all the slices evenly. Still using your hands pick up the potatoes a stack at a time and arrange them vertically in rows or spiral them in from the outside of the dish to the center. It’s important that the potatoes are packed in tightly, even it means slicing, coating, and adding another potato. 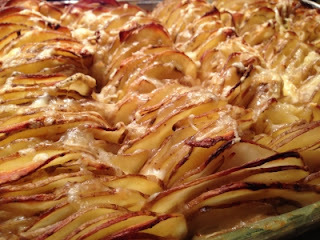 Pour the excess cream mixture over the potatoes making sure not to go higher than halfway up the sides of the dish. Cover with foil and bake for 30 minutes, uncover, and bake for another 45 minutes or until the top is brown and crispy. I was inspired to make these from a recipe I read in the New York Times, it serves six. Happy Thanksgiving!